Pigeon Pose is one of those yoga poses that everyone loves. 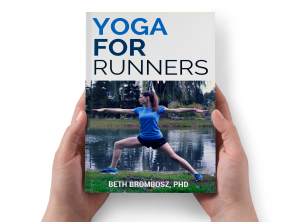 It’s a fantastic hip opener, which is one reason why many runners say it’s their favorite yoga pose. One of the keys to getting the most out of your Pigeon Pose is to make sure that you have good alignment and good form. 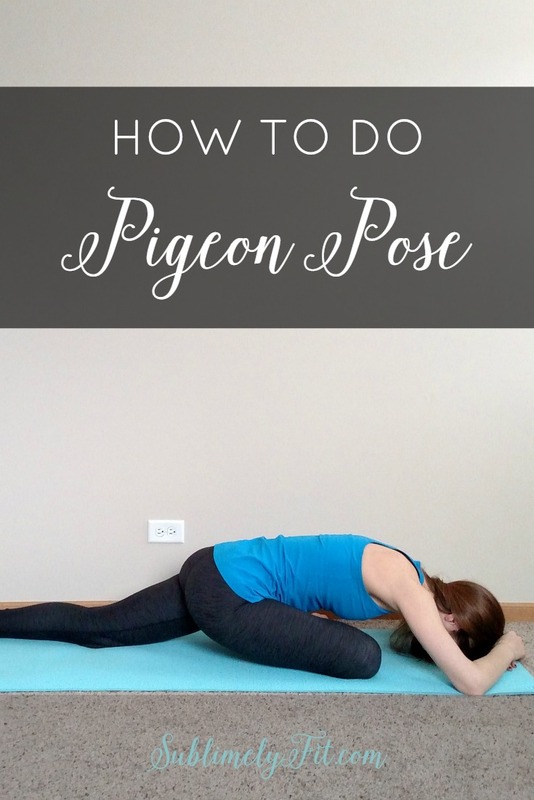 If you haven’t thought much about how you set up your Pigeon Pose, or if you just need a refresher, this step-by-step guide is for you! DISCLAIMER: I am a yoga teacher, but I’m not your yoga teacher. If you have questions about how to set up a pose, it’s best to chat with someone in person who can check your form to make sure you’re performing the pose correctly. 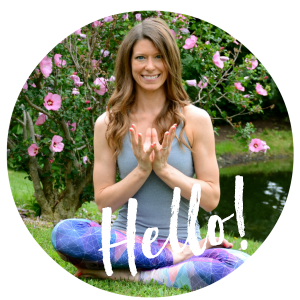 If you have pain while trying to practice a pose, especially in the joints, stop and ask a yoga teacher to show you how to modify the pose for your body. I can’t emphasize this enough: modify the pose so it feels right in your body. If your hips are really tight, Half Pigeon probably isn’t the best place to start. If you try Half Pigeon and you feel like you’re struggling to get into the pose because your hips are too tight, start with Reclining Pigeon. You can find lovely opening with this pose without forcing yourself into the pose. To come into Reclining Pigeon, sometimes also called Figure Four Pose or Thread the Needle Pose, begin by lying on your back. Bend your right knee and bring your right ankle to your left thigh, just above the knee. Flex both feet. Reach your right arm through the window between your legs as your left arm reaches around the outside of your left thigh. Grab your left thigh or shin and pull your legs toward you. To intensify, pull your legs closer to your body, or use your right elbow to press your right knee back. Hold on this side for at least a few breaths, even up to a few minutes, then switch sides. Think you know how to do Pigeon Pose? Make sure you’re doing it right! This version of Pigeon Pose is wonderful because it allows you to relax and surrender into the pose. I prefer to come into Half Pigeon from Downward Facing Dog. Starting in Down Dog, sweep your right leg up for Three Legged Dog, then sweep the leg forward to the top of your mat. Bring your right shin forward, working toward getting your shin parallel to the front of your mat. If you’re tight, you’ll need to keep your foot a little closer to your left hip. Start to straighten your left leg behind you. Look over your right shoulder at your left leg. Looking over the right shoulder helps to square your hips, pulling your left hip up in line with the right. Make sure your left leg is straight and comes out directly behind you. Also take a look at your foot, which should also be straight behind you, not be curving in toward your midline. On an inhale, press your fingertips into your mat as you lengthen your spine. If you feel a nice opening in your hips, stay here with your torso lifted. You also always have an option to bring a block under your right hip for extra support. If you feel you need to go a little deeper, first bring your forearms to a block or to your mat in front of you, leading with your heart. Think about keeping a flat back and bringing your breastbone down toward the mat. You can intensify even more by bringing your forehead to a block or to the mat. Take deep inhales and exhales, keeping your mental focus on your breath. If you’re feeling a lot of tension rise up from your hip, use a forceful exhale with an open mouth to help release that tension. To start, hold the pose for five breaths, increasing how long you hold the pose based on what your body tells you it needs. I like to hold this pose on one side of my body for at least two minutes when I really need a release, sometimes three. Be sure to hold the pose with your left leg forward for an equal amount of time, recognizing that your pose may look a little different on the left side because often one side of the body is tighter than the other. Any questions about pigeon pose? Or, tell me about how much you love pigeon pose! « What Makes You a Runner? Thank you for sharing this post! I forget to lead with my heart and focus on breathe because I’m usually in a hurry. But yoga mustn’t be rushed. 😉 this is indeed one of my favorite poses!! I’ve never tried reclining pigeon, but it looks like a great stretch. Great explanations – thank you for this! It’s a really good one! I really love it for folks who struggle to get into pigeon pose–it’s easier to find the right amount of stretch and not go too deep. Have a great week, Heather! 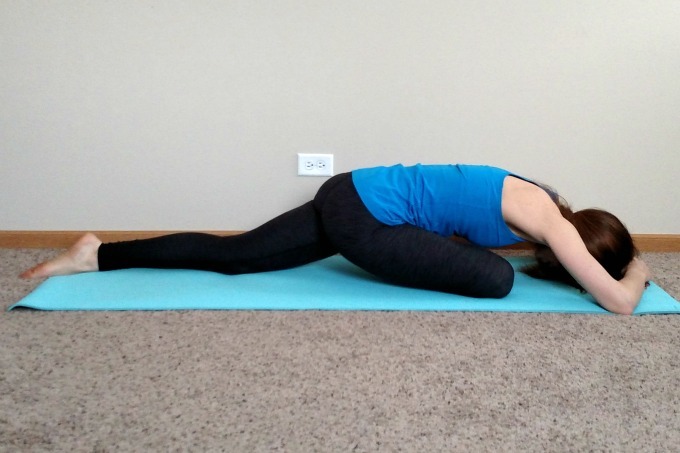 Pigeon pose is painfully good for you! Favorite position when my hips are wonky. Yes, me too! Nothing opens things up like pigeon. My instructor had us do reclining pigeon with our back foot against the wall–that was a different variation! And I like standing pigeon too (figure 4 pose)! Thanks for the refresher! I do love pigeon in all forms! Yes, I love that one! It’s one of my favorite restorative poses, especially for folks who are too tight to do half pigeon. It’s so nice to have the wall to help you hold the pose so you don’t have to actively pull the legs in. Pigeon is my favorite! I also like to do it for 3 minutes on each side, especially after a tough run. My hips are so tight and this really helps. Thanks for the tips!